Our facilities in Ulm, Schwäbisch Gmünd, Aalen, Heidenheim and Biberach offer foods in certified organic quality. Whenever possible, we use organic ingredients in our side dishes as well. The menus are designed in collaboration with a nutritionist. The production processes in campus catering are subject to strict hygiene and quality standards as well as regular inspections. Our staff take regular trainings in hygiene and safety with external providers. 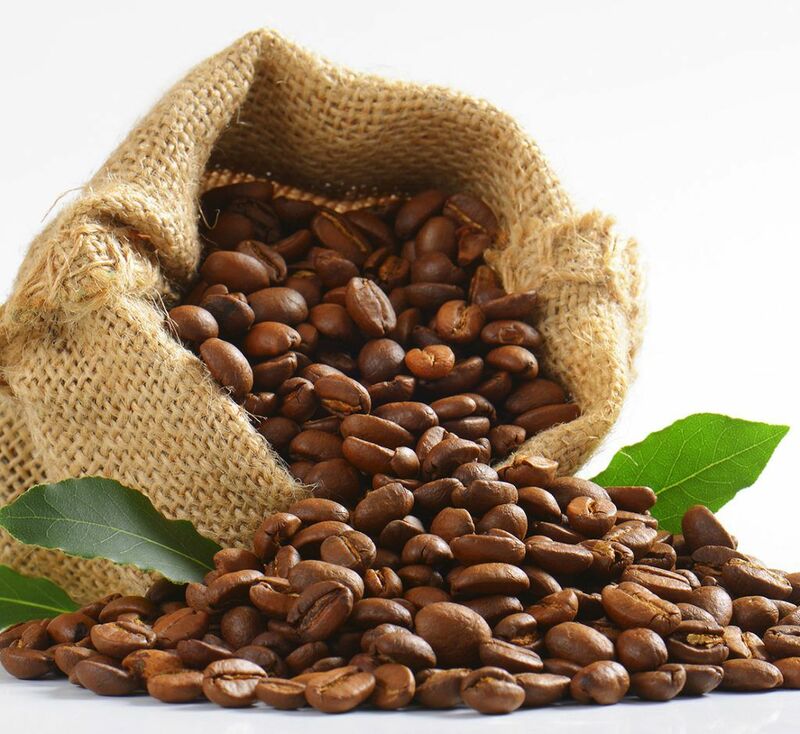 Our cafeterias sell fair-trade coffee – over 7 tons every year! Our Mensa lunchrooms are certified organic. Many products are offered in organic quality. We offer vegan meals and snacks in our cafeterias and Mensa lunchrooms. We sell fair-trade products, e.g over 7 tons of coffee per year, sugar sticks, LemonAID, ChariTea etc. We exclusively use free-range eggs. The majority of our salads are from controlled farming. We use fish from non-threatened stocks. Our production is based on defined hygiene and social Standards. 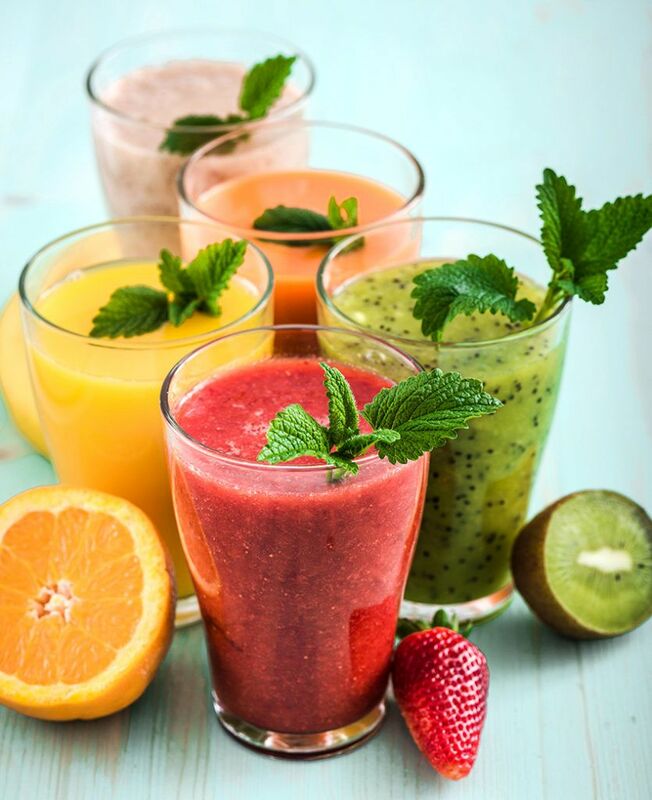 The Studierendenwerk Ulm campus catering selects, procures and processes its products and ingredients in accordance with high ethical standards. The day-to-day business in our Mensa lunchrooms and cafeterias is defined by values like environment, sustainability, ethical animal husbandry, "honest food", additive-free when possible, fair treatment of providers, staff and customers. Protection of the environment is of great importance to us. We therefore introduced reusable tableware in all meal services – with the exception of the cafeteria SouthSide and the WestSideDiner at Ulm University. Our Mensa lunchrooms offer one vegetarian meal every day. 1-2 times per week, we serve a vegan meal in our Mensa lunchrooms. The soups are always vegan! You will be able to find something to eat or drink in all areas of our facilities (snacks, protein products, fruits etc.). You can also request single-serve packets of soy milk for your coffee at the check-out. The animal rights group Peta has awarded the Mensa in Ulm with two stars as vegan-friendly Mensa. Arabic for "allowed, permitted, pure"
Foods that are labeled "halal" comply with Islamic regulations and can be eaten by Muslims. 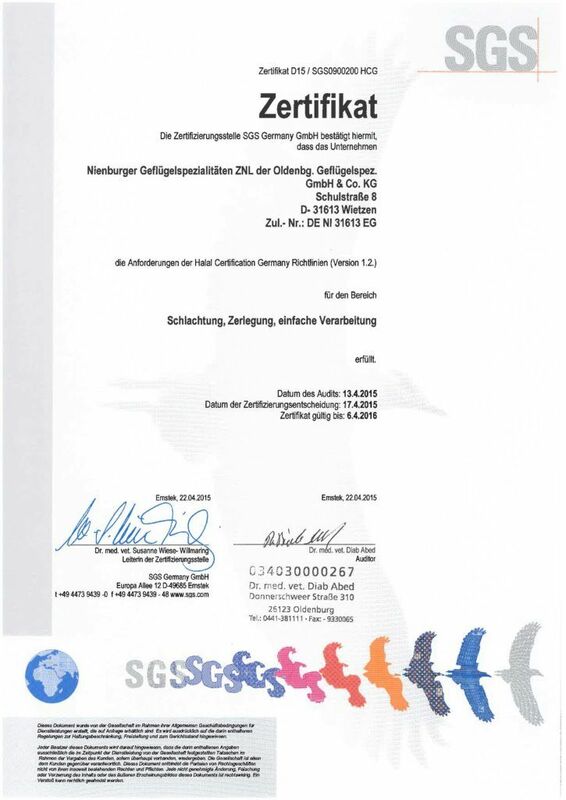 We obtain our halal meat from a German supplier who warrants halal slaughtering with anesthetization of the animals. 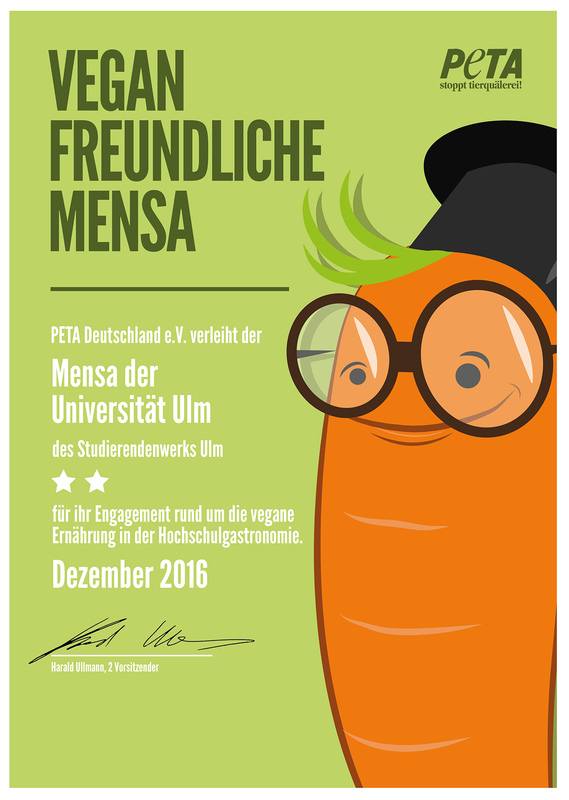 If you have any questions, please contact guenter.mayr@studierendenwerk-ulm.de. Our Mensa lunchrooms are certified organic. We process predominantly MSC-certified fish from non-threatened fishing zones (the fish buffet might occasionally contain other fish). The coffee cups are FSC-certified. The plastic packaging is PLA instead of PTE, which has a biodegradable molecular structure. 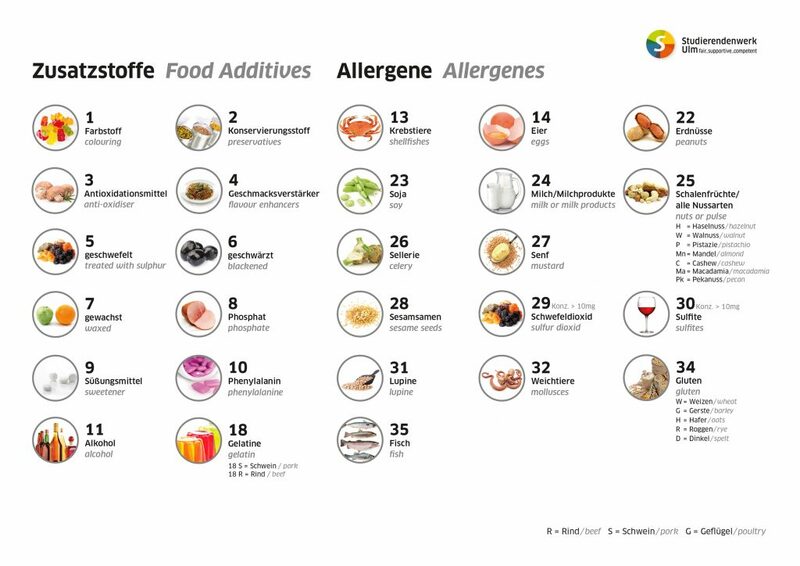 Allergens are labeled on every product we sell. Allergen folders are provided at all check-outs, where you can obtain information on ingredients and allergens of unpackaged products.